In a previous article I shared how extensive reading could be exploited to develop oral proficiency (Baker, 2007). Omaggio (1986) provided the definition of oral proficiency which served as my reference. Omaggio’s definion states, “oral proficiency includes the ability to communicate verbally in a functional and accurate way in the target language.” I included communicative competence in this view of oral proficiency. Klee (1998) defines communicative competence as “knowing how, when, and why to say what to whom”. This article explores the relationship between oral fluency and oral proficiency. It examines the polysemous nature of the term “oral fluency” through the eyes of its investigators and its practitioners. It looks at various, well known, highly regarded, international testing programs which consider oral fluency to be an element of oral proficiency during speaking exams. Finally, implications for the classroom are discussed with an emphasis on exploiting extensive reading to develop oral fluency. Can extensive reading be used to develop oral fluency? Day and Bamford (2004) collected a number of extensive reading activities from contributors in which the stated aim was to develop oral fluency. As a result of personal experience, I share their conviction that “good things happen to students who read a great deal” (Day and Bamford, 2004, pg. 1). Oral fluency is one of those “good things” which they refer to. Furthermore, a huge body of converging, empirical research, as well as qualitative evidence, affirms the positive effects of extensive reading to develop oral fluency, and by extension, communicative competence. Adjective – When a person is fluent, they can speak a language easily, well and quickly. Example: She’s fluent in French. When a language is fluent, it is spoken easily and without many pauses. Example: He speaks fluent Chinese. He’s a fluent Russian speaker. However, a second meaning of fluency has evolved related to the goals of English Language Teaching (ELT) and the aim of oral fluency development in a communicative classroom (see Brumfit, 1984). In this sense, there are a number of definitions which are perfectly valid from the perspective in which oral fluency is viewed. 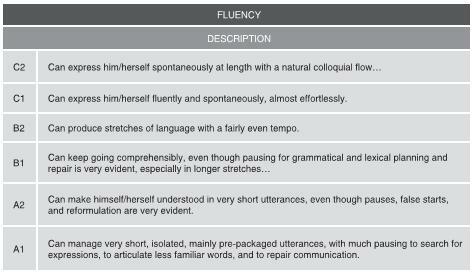 Fillmore (1979) identifies four categories of fluent speakers. The first one is the speaker who speaks fast, that is, who fills time with talk such as a disk jockey. The second is the speaker whose speech is coherent, complex and dense. The third type of fluent speaker is one who knows how to use language appropriately, and in a variety of contexts. The fourth type of fluent speaker controls aesthetic functions of language, being creative and imaginative. For Lennon (1990), there is a “broad sense” and a “narrow sense” for fluency. The broad sense is represented by “the highest point on a scale that measures spoken command of a foreign language” (p.389). The narrow sense refers to “isolatable components of fluency such as correctness, idiomaticness, relevance, appropriateness, pronunciation, lexical range, and so on” (p.389). articulatory fluency, i.e. linking together speech segments. Furthermore, non-fluency in an English language learner is evident in frequent pauses, repetitions, and self-corrections. Riazantseva (2001) showed that fluency is related to controlling pausing and hesitation events. She investigated the relationship between L2 proficiency and pausing patterns. She found that native-like fluency presents norms of pause duration, frequency, and distribution of these pauses throughout language production. She concludes her study by suggesting that knowing how to pause and hesitate in an L2 is part of fluency characteristics to be achieved by L2 learners. Dr. Jack Richards, in a recent online publication entitled “Communicative Language Teaching Today”, defined fluency as “natural language use occurring when a speaker engages in meaningful interaction and maintains comprehensible and ongoing communication despite limitations in his or her communicative competence.” (pg. 13, http://www.professorjackrichards.com/work.htm). His definition appears to be in harmony with Brumfit’s view of oral fluency. Regardless of which definition of oral fluency one subscribes to, there is a common characteristic in most, though by all means not all, definitions of oral fluency. Here, I refer to “speed” or “rate of speech”. There is a widely held notion that the more fluent you are, the faster you speak, and consequently, the more proficient you are. In my view, oral fluency is an essential factor, or component, of oral proficiency, which includes communicative competence. What supports this view of oral fluency as a factor of oral proficiency? Many oral examinations include oral fluency as a criteria on which to assess a candidate’s oral proficiency. To name but a few of these exams: the Foreign Service Institute (FSI) Oral Interview, the American Council on the Teaching of Foreign Languages (ACTFL) Oral Proficiency Interview, Common European Framework of Reference for Languages (CEFR), University of Cambridge ESOL exams and the Test of English as a Foreign Language internet based test (TOEFL iBT). Speech is so halting and fragmentary that conversation is virtually impossible. Speech is very slow and uneven except for short or routine sentences. Speech is frequently hesitant and jerky; sentences may be left uncompleted. Speech is effortless and smooth, but perceptibly non-native in speed and evenness. Advanced Level: Copes with speech at normal speed, responds promptly, speaking neither too slowly nor hesitantly. Intermediate Level: Will have breaks in comprehension in normal, rapid speech presentations and his own speech will be of less than native tempo for stretches. Basic Level: Although not needing unnaturally slow enunciation, sometimes has to be addressed somewhat deliberately. Speaks with some unevenness of tempo. The University of Cambridge ESOL First Certificate Exam (FCE) handbook, states the following in the assessment and marking section (pg. 48) under Interactive Communication: “This refers to the ability to interact by responding and initiating appropriately and at the required speed and rhythm to fulfill the task requirements”. Table 1: Fluency descriptors and corresponding proficiency levels (Can Do statements). What are the classroom implications for oral fluency activities? As I mentioned earlier, I would like to emphasize the role of extensive reading activities in developing oral fluency. Extensive reading activities meet all of the conditions outlined above by Dr. Richards. Bamford and Day’s book, “Extensive Reading Activities for Teaching Language” (2004), includes over 18 extensive reading activities all designed with the stated aim of developing oral fluency. They range from book reports to drama activities. I’d like to highlight one of these activities, the 4/3/2 Technique, which was contributed by Willy A. Renandya, SEAMEO Regional Language Centre, Singapore (pp. 95 – 96). The 4/3/2 Technique is a repeated speaking activity with decreasing speaking time allowed (4 minutes/3minutes/2 minutes). It was researched by Nation (1989) and Arevart and Nation (1991). Their research showed that students’ speaking rate increased, while their hesitations decreased with each repeated talk. In addition, various types of grammatical errors were eliminated, and sentence structures improved with each repetition. They showed that this technique allowed learners to perform at a level higher than their normal level of fluency. Terminology in English Language Teaching (ELT) can sometimes be confusing. As we have seen in this article, one researcher’s “oral fluency” can in fact differ substantially from another researcher’s “oral fluency”. The polysemous nature of terminology should not be regarded negatively however. I feel that it simply underscores the rich diversity and complexity inherent in our profession. As such, in ELT we need to be conscious of the fact that there is indeed both an empirical, quantitative research heritage and a qualitative research heritage from which we as practitioners can draw on to inform our practice. Seen in this light, we can enrich students’ English language learning experiences by making a place for extensive reading activities in our classrooms. Arevart, S. and Nation, P. (1991). Fluency improvement in a second language. RELC Journal, 22, 1, pp. 84- 94. Baker, T. J. (2007). Developing oral proficiency through extensive reading. IH Journal, 22. Bamford, J. and Day, R. (2004). Extensive reading activities for teaching language. Cambridge: Cambridge University Press. Brumfit, C. (1984). Communicative methodology in language teaching: The roles of fluency and accuracy. Cambridge: Cambridge University Press. Cambridge Advanced Learner’s Dictionary, (2007). Definition of “fluent”. http://dictionary.cambridge.org/ (Retrieved March 4, 2007). Common European Framework of Reference for Languages Manual, (2003) Language Policy Division, Council of Europe, Strasbourg, France. http://www.coe.int/T/DG4/Portfolio/?L=E&M=/documents_intro/Manual.html (Retrieved March 4, 2007). Carroll, B. (1980). Testing communicative performance . Oxford: Pergamon. Faerch, C., Haastrup, K. and Phillipson, R. (1984). Learner language and language learning. Clevedon: Multilingual Matters 14. Cambridge University Press, (2006). FCE Handbook, Paper 5, Speaking, pg. 48. http://www.metodocallan.net/fce_hb_samp_p5_faq.pdf (Retrieved March 4, 2007). Fillmore, C. J. (1979). On fluency. In C. Fillmore, D. Kempler & W.S.Y. Wang (eds). Individual differences in language ability and language behavior. New York: Academic, pp. 85-101. Jones, R. L. (1979). “The FSI Oral Interview”. In Spolsky, B. (ed.) Papers in applied linguistics : Advances in language testing (Series 1) . Arlington, Virginia: Center for Applied Linguistics. Klee, C. A. (1998). Communication as an organizing principle in the national standards: Socio-linguistic aspects of Spanish language teaching. Hispania, 81 (2), 339 – 351. Lennon, P. (1990). Investigating fluency in EFL: a quantitative approach. Language Learning, 40, 387 – 417. Omaggio, A. (1986). Teaching language in context: Proficiency oriented instruction. Boston, MA: Heinle and Heinle Publishers. Renandya, W. (2004). The 4/3/2 Technique. In Bamford, J. and Day, R. (eds.) Extensive reading activities for teaching language. Cambridge: Cambridge University Press. pp. 95 – 96. Riazantseva, A. (2001). Second language proficiency and pausing: A study of Russian speakers of English. Studies on Second Language Acquisition, 23, pp. 497-526. Richards, J. (2007) Communicative language teaching today. Cambridge: Cambridge University Press. http://www.professorjackrichards.com/work.htm (Retrieved March 4, 2007). Thomas Baker is a CELTA-quaified EFL teacher with six years experience in Chile. He currently teaches at Colegio del Verbo Divino, a Catholic school for boys. Back to Issue 24: Spring 2008 of the IH Journal of Education and Development.